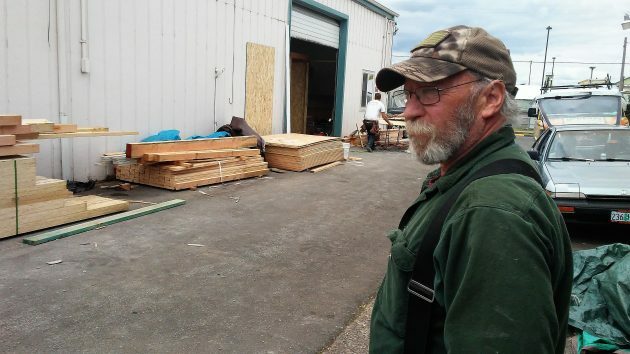 George Matland watches Monday as contractors turn this former warehouse into a homeless shelter. With the help of CARA, the downtown urban renewal district, the mission is converting a former warehouse at 405 11th Ave. S.E. as a shelter with room for 114 people — men in one half of the building and women in the other. Some of the spaces will be for men who have daytime jobs but no place of their own to stay. Others will be for families including children. 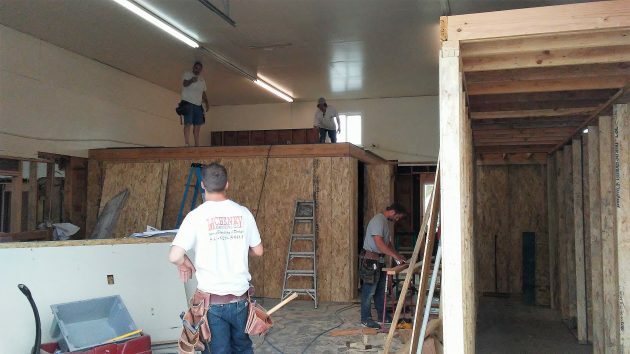 When I checked in with Matland on Monday, a crew for McHenry Remodeling was at work on the interior, creating wooden partitions for the individual units. In part of the space, a fresh concrete floor covered newly installed plumbing for bathrooms. Outside, a big pile of broken concrete testified to the labor of jackhammering the old floor. Matland says the remodeling will be finished in time for people to move in before July 1. The shelter will be part of the mission’s complex at 11th and Jackson Street, across Jackson from the Linn County Jail. Other buildings there house the mission’s offices, food distribution, warming shelter, needle exchange, and church. The nondenominational mission, started by Matland’s mother, the late Maxine Matland, is in its 36th year in Albany. Her son runs it now, as director and pastor. Typically dressed in work clothes and suspenders, he says “this is my Sunday best.” Why does he do what he does? He was “messed up” when he was young, he says, and someone — “my Mom” — rescued him. He figures it’s his role to try to do the same for others. Matland says the shelter project is going to come in at about $200,000. The mission is getting a $100,000 loan from CARA at 2.9 percent interest for five years. Another $50,000 was a grant from the Community Services Consortium. (I didn’t pin down where the rest was coming from.) Matland figures the mission will be able to repay the CARA loan with earnings from its annual venture in Christmas tree sales. As part of the CARA deal, the mission agreed to close its shelter at 120 Seventh Ave. S.W. That house is in the name of Matland’s sister, who is working on selling it. Matland says there has been interest in the house from several potential buyers. Construction was under way in the former warehouse on Monday afternoon. It’s crazy who gets forgivable loans and who doesn’t .